If altered ambiences are your thing, this pedal does a wide range of them incredibly well. 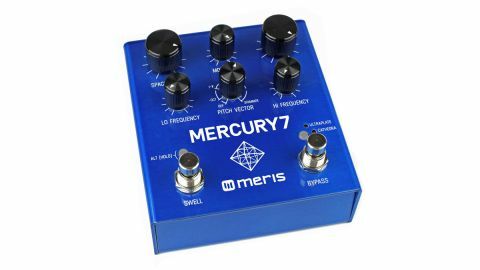 The high-end digital reverb pedal such as a Strymon Big Sky or Eventide Space has become a much-coveted item for those wishing to add ambience with a classy sheen to their ’board - and the Mercury7 is the contribution from Meris, whose team includes a founder of Strymon. Derived from the 500-series module of the same name, and apparently inspired by the Blade Runner film and its Vangelis soundtrack, it is designed to deliver extra-long decays and lush modulated reflections. The pedal offers a choice of two algorithmic reverbs, Ultraplate and Cathedral, with a host of sound adjustment features including pitch and modulation parameters. Capable of mono and stereo operation, the pedal has two sets of parameters for each of its six knobs, the second set accessed by pressing Alt. Mix sets the reverb against the dry signal, going up to fully wet so the pedal can be used in effects loops, with overall reverb time set by the Space Decay knob. Within the reverb tail, you can set separate decay values for high- and low-frequency sounds - useful for adjusting the size of the perceived space. Modulation with adjustable depth and speed can be added to the mix to put a sense of movement into the reverb tail, while the Alt function of the Hi Frequency knob adds in a cool vibrato effect, not unlike a rotary speaker, before the reverb. The most dramatic alteration of sound is via the Pitch Vector knob, which offers a shift of five different pitch intervals within the reverb: octave down, slight pitch up (which can sound like a peal of bells in the background), slight pitch down, 5th up, or octave up, which delivers the classic shimmer effect. You can dial up awesome reverb with many dimensions. There are 16 internal presets, but you can only access them with external gear - a four-button footswitch for the first four or MIDI control for all of them. However, two cool facilities aid onstage performance: the second footswitch offers an automatic swell effect that works like a volume pedal, fading the sound up at an adjustable speed and great for pad sounds, while an expression pedal adds scope for such things as fading the pitch intervals into your reverb.